Almond Coconut Moi Moi is prepared with the gluten-free, low carb almond floor. With a net carb of 10g per cup, you should be using almond flour to prepare your Moi Moi if you are on a low carb diet. 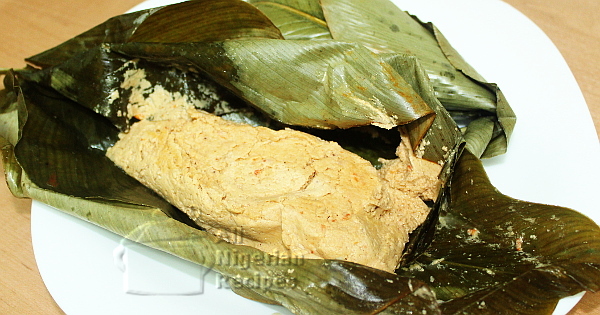 It tastes like the classic Nigerian Moi Moi with a slight difference in texture. For best results, use uma leaves to wrap the Almond Coconut Moi Moi. You can also use Aluminium Foil Bags or banana leaves. For the most tasty Almond Coconut Moi Moi, use homemade coconut milk. If you are not able to make it, use canned coconut milk. Tatashe pepper is spicy hot, when using it, you may want to skip habanero or scotch bonnet peppers which are also spicy hot. If you only have almond nuts, click here for how to turn it into almond flour. There is no need to add more oil when preparing Almond Coconut Moi Moi because coconut milk and almonds contain oil. All the vegetables must be thoroughly washed. Wash the uma leaves thoroughly and set aside. If using aluminium foil bags, click the link above to make them. 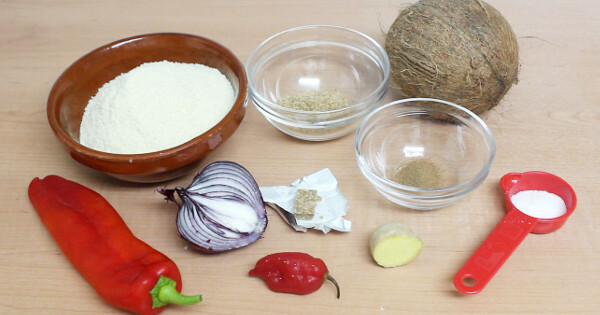 Prepare some coconut milk if you will be using homemade coconut milk. Peel the ginger, cut into pieces and pound it. Rinse with some coconut milk to extract the juice. Deseed the sweet peppers or tatashe and cut into pieces. Cut the habanero pepper and onion into pieces. Put the almond flour, onions, diced peppers, ginger flavour extract, ground crayfish, ground nutmeg, stock cube (crushed) into your blender. Add just enough coconut milk to help the blades of your blender move. Blend till everything is smooth. Pour the blend into a bowl, stir very well and add salt if necessary. Wrap the moi moi blend with the uma leaves. Watch the video below to see how I did that. Place the wraps of almond coconut moi moi into a pot of boiling water. See the video below for how I use a base so the wraps do not cook in a pool of water. 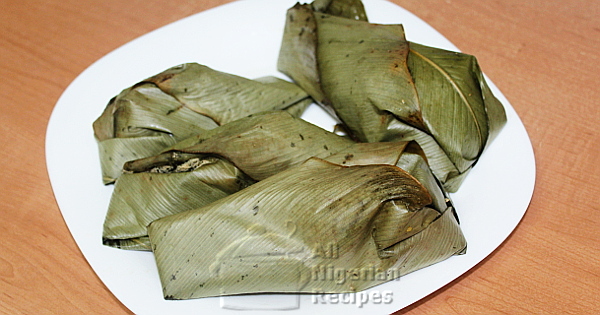 Use one uma leaf to cover the wraps of almond coconut moi moi to keep the heat in. Cover the pot and cook till done. This takes 30 to 40 minutes on medium heat. Top up the water when necessary as you cook. When done, remove the wraps from the pot, place in a flat tray and allow to cool down to a comfortable temperature before serving. Serve on its own with a chilled drink or as side dish to lots of Nigerian recipes such as Steamed Leafy Veggies. Watch the video below for the demo.